Einstein, A Hunch And Decades Of Work: How Scientists Found Gravitational Waves : The Two-Way Behind the headlines and news conferences announcing the discovery were decades of hard work, hundreds of scientists and more than a billion dollars in taxpayer funds. On Thursday, researchers announced the discovery of gravitational waves --wrinkles in the very fabric of space-time. But behind the headlines and news conferences were decades of hard work, hundreds of scientists and more than a billion dollars in taxpayer funds. "It's profoundly satisfying that it came out the way that we intended, we'd hoped, we'd dreamed," says Kip Thorne, a gravitational theorist at Caltech who co-founded the project. The idea of gravitational waves started 100 years ago, when Albert Einstein revolutionized physics with a theory of gravity called general relativity — which reimagined the force of gravity as a warping of dimensions of space and time. The theory made a lot of startling predictions. One of them was that very heavy objects such as black holes should produce ripples in space-time itself. The ripples stayed in the realm of theory until the 1960s, when a researcher named Joseph Weber began working on ways to actually detect them. At the time, another researcher named Rainer Weiss was teaching at MIT and some of his students started asking him about Weber's work. "That was the beginning for me," Weiss says. 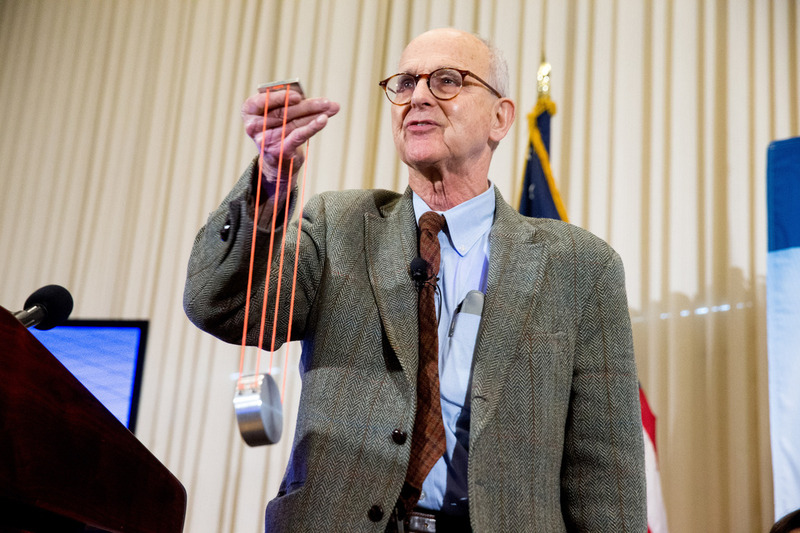 LIGO co-founder Rainer Weiss uses a visual aid as he speaks during a news conference Thursday at the National Press Club in Washington, D.C., announcing that scientists have finally detected gravitational waves, the ripples in the fabric of space and time that Einstein predicted a century ago. Catching a wave is a tough problem. Gravitational waves bend space only a tiny, tiny amount — a small fraction of the diameter of a subatomic-particle. Weiss and other researchers spent more than a decade just tinkering, trying to figure out how to do it. Eventually, they came up with a plan. The idea was to build a giant laser and place it between two-high precision mirrors set in an L-shape. Bouncing light off the mirrors, each of which would be miles away, would provide a stunningly accurate measure of distance. On paper at least, it could detect the stretching and squishing of space by gravitational waves. But the giant lasers and long tunnels needed would be enormously expensive. Weiss and his colleagues went to the National Science Foundation for money. There were doubts, in part because other scientists recalled Weber's failed attempts decades earlier. But eventually, a panel of eminent scientists endorsed the project. "They said, 'Hey this is a great idea. You should do it. It's risky, but it's exactly what the country needs,' " Weiss recalls. His MIT group joined forces with a team from Caltech. Using NSF funding, they built two detectors, one in Louisiana and the other thousands of miles away in Washington state. 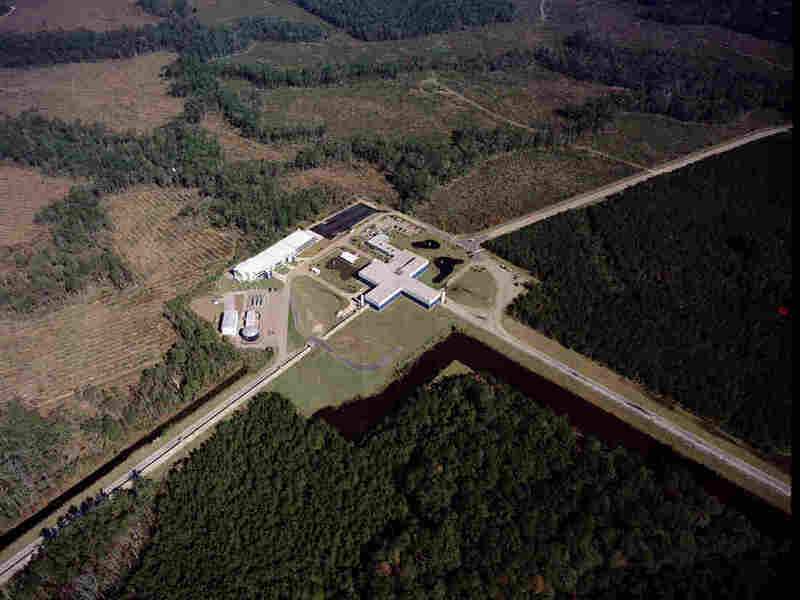 Known as the Laser Interferometer Gravitational-Wave Observatory (LIGO), the machines began to search. Throughout the 2000s, their highly sensitive lasers registered trees being logged in Louisiana and earthquakes in rural Washington. But they failed to detect gravitational waves. The scientists were undaunted. "It was always exciting," says Gabriela González, a researcher at Louisiana State University and spokesperson of the LIGO scientific collaboration. "Just working on such a high-precision instrument was what I always liked." NSF approved an upgrade to LIGO in 2004, and four years later, researchers got to work on the enhancements. They completely overhauled the lasers and mirrors and turned on Advanced LIGO in 2015. The Laser Interferometer Gravity-Wave Observatory measures tiny changes in the lengths of each of its 2.5-mile-long arms. The arms stretch and squeeze as gravity waves pass by. All told, the U.S. and other nations invested $1.5 billion into the esoteric project, according to NSF Director France Córdova. It was the riskiest thing the NSF had ever done. So she was more than a little relieved when one of her deputies burst into her office last fall with the latest on LIGO. "He said, 'France, you want to hear some good news for a change?' " Córdova says, chuckling. The gamble had worked. On Sept. 14, 2015, at 5:51 a.m. ET, an alarm went off in Louisiana. Researchers in Germany, who were already analyzing the data, quickly identified a possible wave. The Washington state detector had seen it, too. The distortion in space was just 1/1,000 the diameter of a proton, but it was there. "I felt disbelief," Weiss says. "Until we really did the checks, and then little by little, all of us began to believe." It was the collision of two black holes, each about 30 times the mass of the sun. They had smashed together far outside our galaxy, some 1.3 billion light-years away. The researchers spent months making sure, but in the end, there was no doubt. The signal was real. For Weiss, who'd started working on the project five decades before, there was joy, but also relief. "A monkey came off my back," he says.